Soc Mammy: Books, glorious books. I love reading. I was such a bookworm as a child, it was my escapism, my refuge and sanctuary. I am hoping to share that love of reading with my daughter, to pass it on. She is only 25 months, so it's quite early, but since she was born I have been reading to her. Smidge eats sweets and changes colour accordingly, until he finally stuffs himself so much that...well, you'll have to read it to find out! If Big can...I can, about a pair of bears - well, technically a Koala isn't a bear - but a big friend and a little friend, and how friendship is the most important thing. 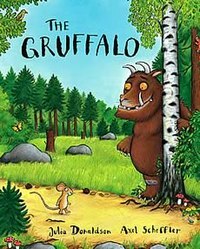 The Gruffalo - the book that launched their careers and made the pair household names - well, in households that have children anyway! A clever mouse avoids the pitfalls of the deep dark wood - while poetry is made fun from a young age! This is the sequel, E prefers it to the original, perhaps because it's about a little girl Gruffalo who goes on an adventure. Monkey Puzzle - about a little monkey who has lost his mum, and the well-meaning butterfly who helps him/her find her again - though all is not simple, as the butterfly makes a few assumptions as the monkey describes its mother. Lots of learning in here as well as more fun rhymes, and beautiful illustrations with plenty to look at and talk about on every page. Tabby McTat, the busker's cat - this one is probably, technically, for a slightly older child. It's about a busker and his cat and what happens when they get separated. The illustrations are captivating as always, showing us modern Britain, with women in burkas and homeless men under bridges alongside more traditional imagry. As with the others, though, it is a heartwarming and magical story, and currently E's favourite book. We also have and love Room on the Broom and A Squash and a Squeeze - also classics, with beautiful artwork and fun rhymes the whole way through. Julia Donaldson and Axel Scheffler have both also worked with other artists/writers respectively, but these works just aren't as good - there is something special about their partnership. They seem to "get" each other. Hairy Maclary from Donaldson's Dairy - about a little dog who goes for a walk, and is joined by other dogs - none of whom are as brave as they should be! The version we were given has a CD as well, read by David Tennant, so E can listen to him read it instead of me, if she prefers - or if I have something else to do, like tidy up (yeah, we all know that's a joke! Hah!). Oliver's Winter Adventure, in which a little bear defies his kind's need to hibernate the whole Winter, in order to have some adventures in the snow. He climbs trees, skates, makes a snow-bear and slides down a hill. All things E is looking forward to doing if we get snow - last year we barely had any, the year she was a newborn at this time of year there was so much we were pretty much snowed in. A little bit would be nice this year, enough to make a snowman/snow bear at least. We also read some Winnie the Pooh books, which make me want to speak in a very "proper" English accent. I loved Winnie the Pooh as a child. Not so convinced by the Disney version, but hey, maybe that's just me being an old curmudgeon. Christopher Robin was one of my imaginary friends when I was 3/4 years old, a time when I didn't have any real friends or playmates my own age, so he will always hold a special place in my heart. So, these are a few of the books we love. Any recommendations for others? I was the same. Total bookworm. and I think (hope) my daughter is catching the bug too. We love Oliver Jeffers' "Lost and found" and "The way back home.